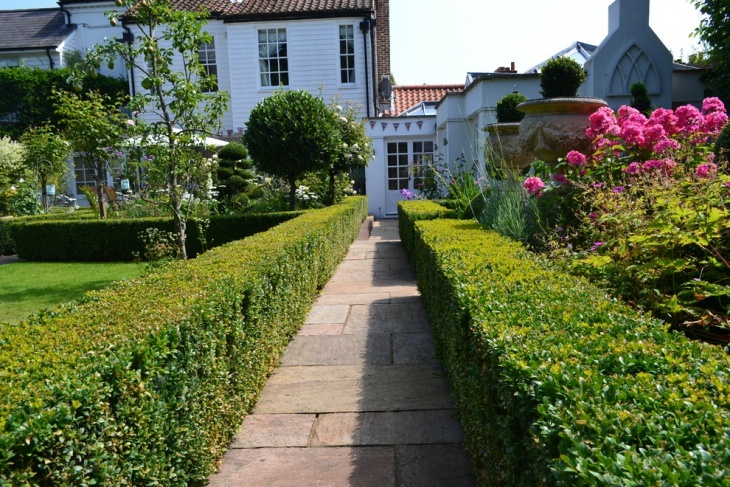 If you are thinking of creating an English-themed garden, then it would be a good idea to educate yourself with the most common elements of British landscaping. 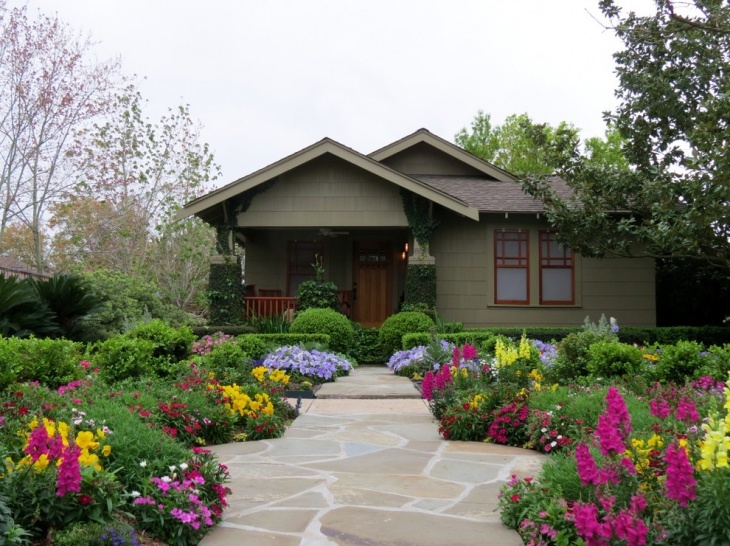 For instance, learn more about the choices of plants, shrubs, flowers and trees. 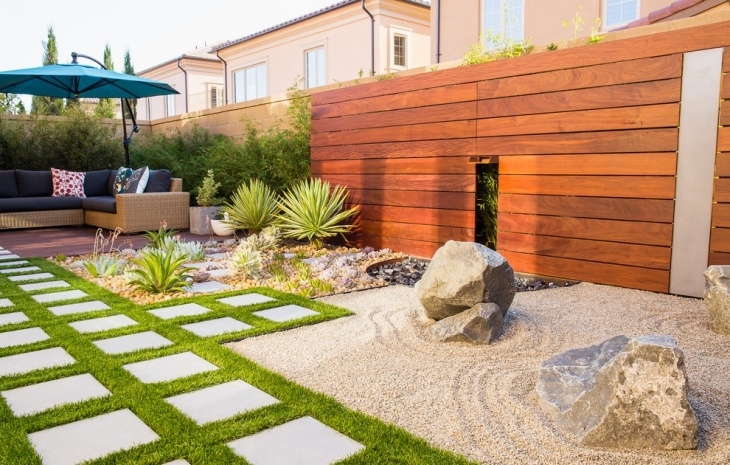 It would not hurt you to know more about the different accents and pavers used. 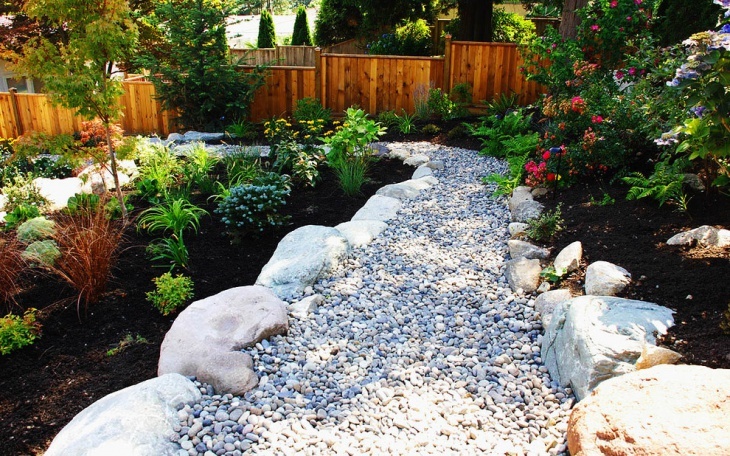 The use of black and cream colored mulch for this English country garden design is a great idea. The cream mulch provides a pretty foundation for the fountain, which is surrounded by small plants. 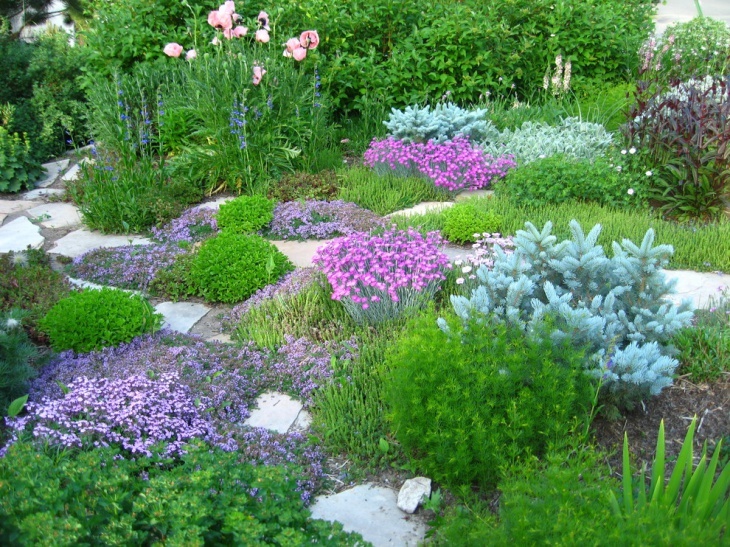 Lots of greens are scattered all over the entire garden, with splashes of colors here and there brought by the flowers. One of the best accents used if the Japanese entry gate/fence. 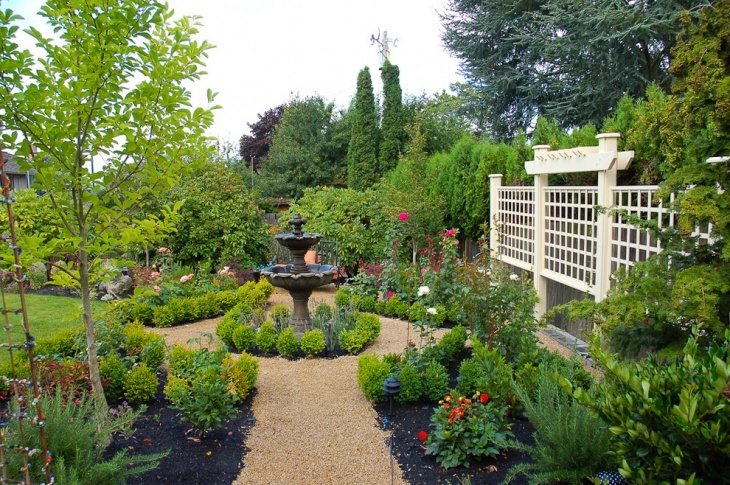 English formal gardens are known for their perfectly manicured lawns and perfectly chosen plants, shrubs, trees, flowers and paving options. 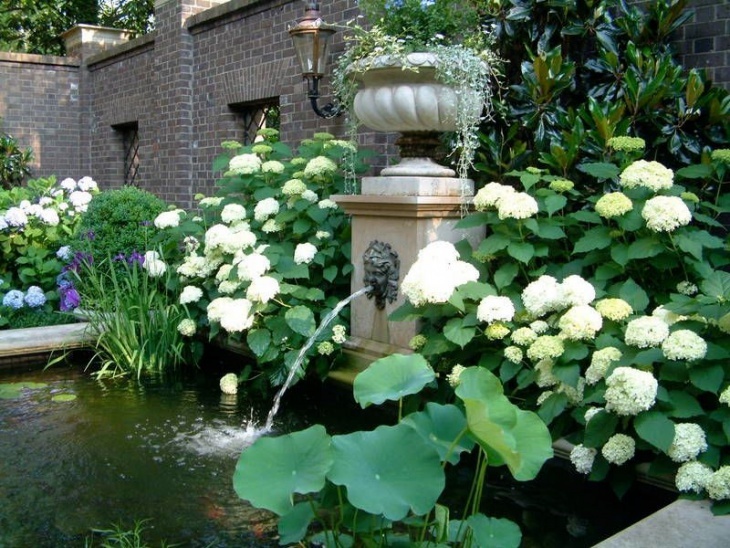 This English garden, for instance, perfectly displays a beautiful arrangement of plants – each kind is placed accordingly. There is no randomness involved here, and the accents are also excellently chosen. 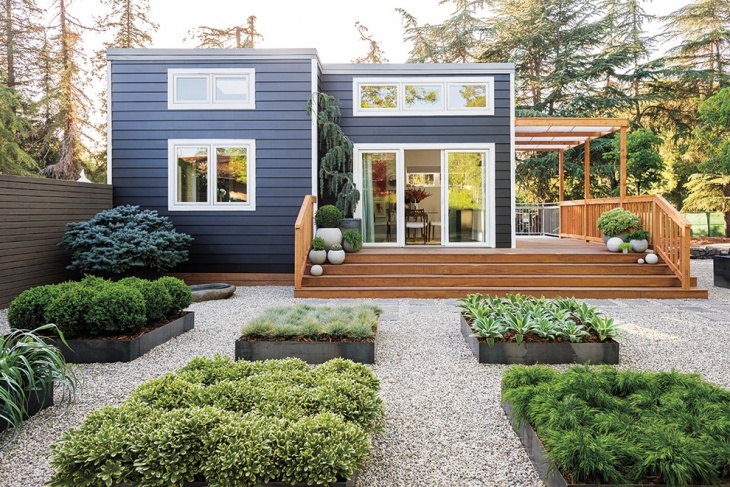 Some gardens are more into greens, and others are more into lawn settings. But if you love flowers so much, you can go for a more floral appeal. 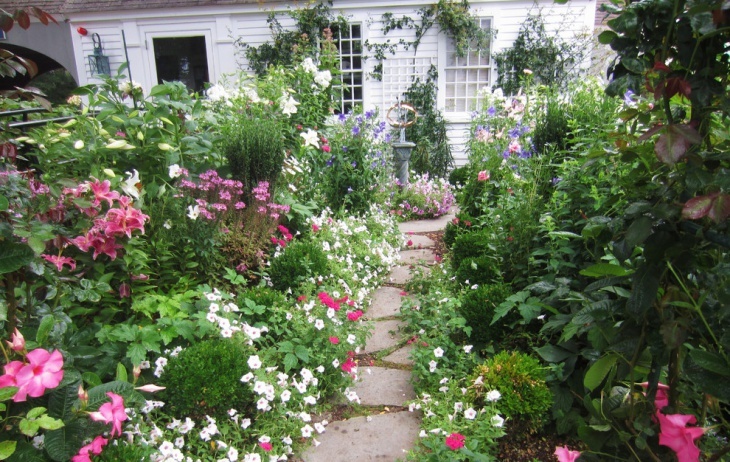 This garden, for instance, displays different flower species, each of which is planted in groups with irregular white pavements providing space and stepping features. Sometimes randomness is better than perfect arrangements. 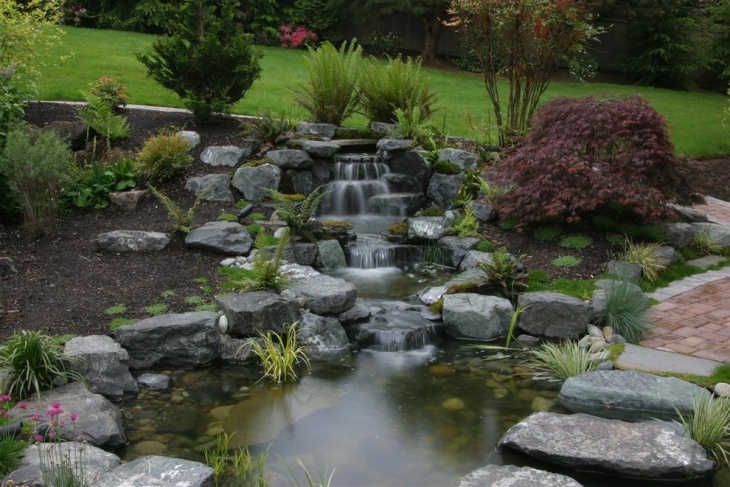 This is particularly true if you are trying to create a nice and relaxing contemporary designed English garden. 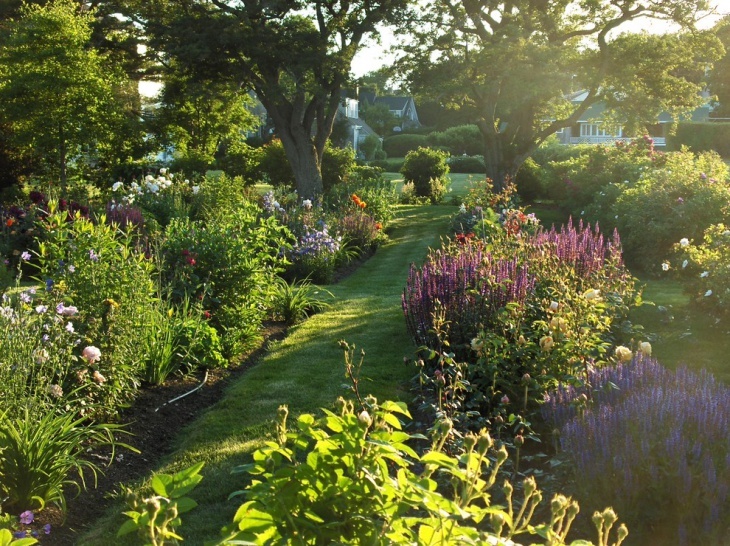 Use of perennials is your best bet. The grassy path walk provides a simple and all-natural track throughout the garden. 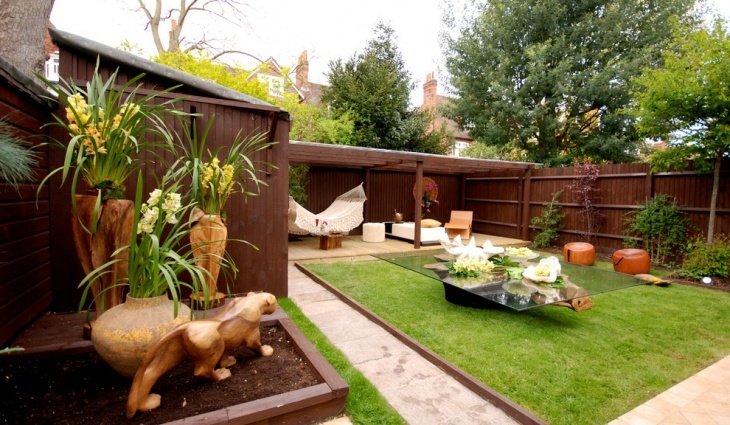 For a limited garden space, you may want to take a few tips from this small English garden. 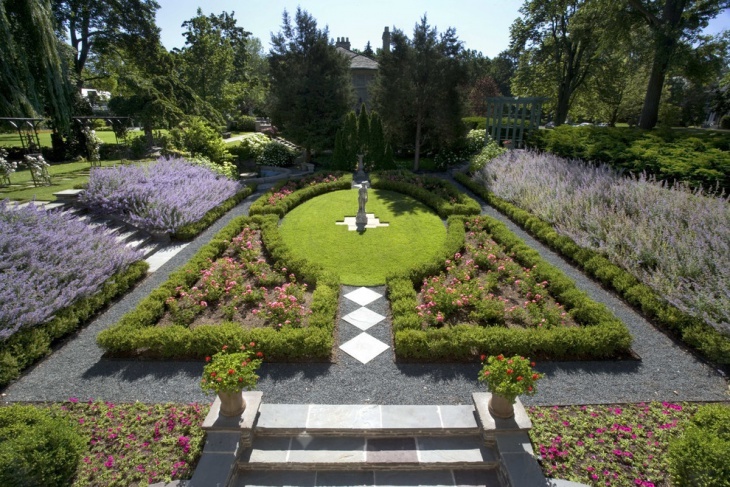 The center of the space is reserved for the manicured lawn. 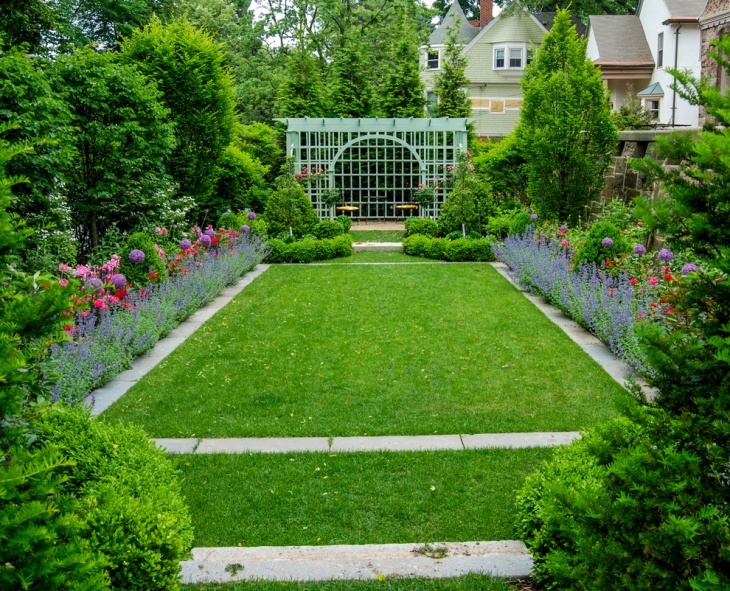 Assortments of greens and colorful flowers are ideally planted on two long sides, while a path leading to a small pergola is at the end of the lawn. 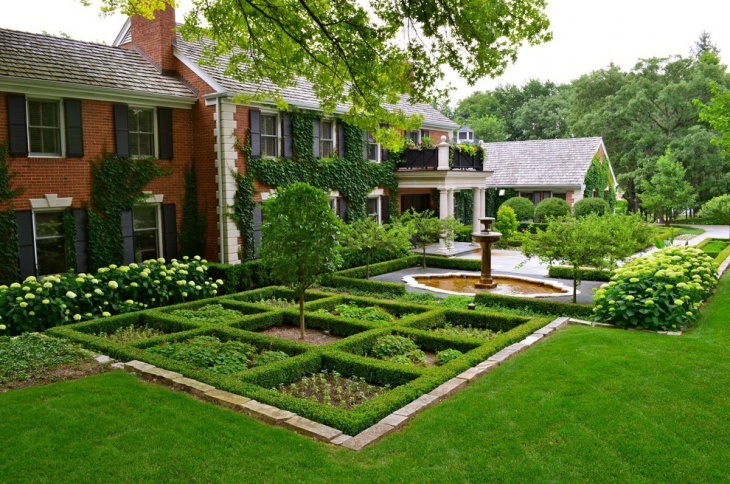 This backyard English garden is the perfect representation of formality, beauty, and elegance in landscaping. 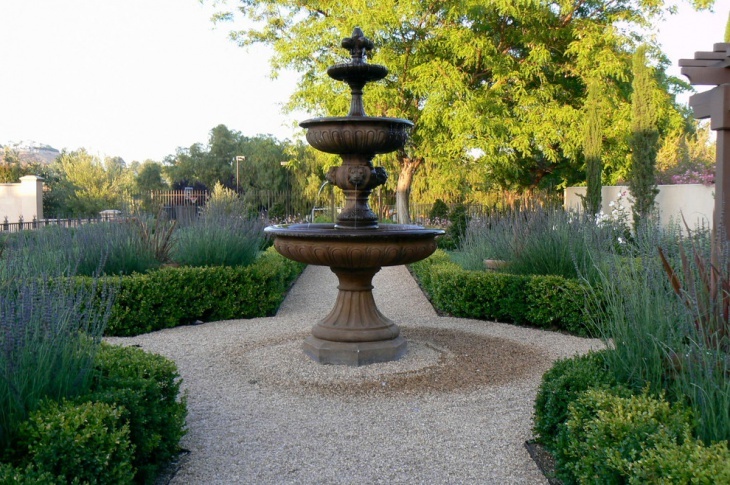 Everything is simply perfect – from the perfectly manicured lawns to the fountain, and to the center tree. Pink English rose is the perfect choice for flowers if you want a truly magnificent English garden. 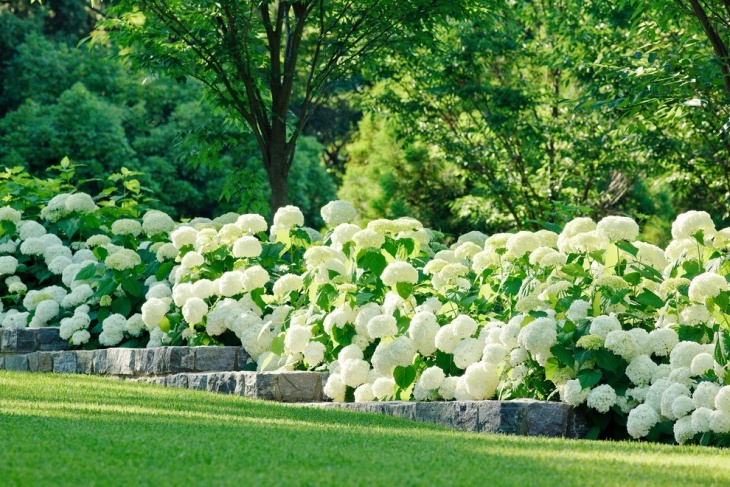 Landscaping in white should be your option if you want to really bring out the beauty and elegance of this rose variety. Planting Veronicar culvers in between some greens is definitely a great idea. 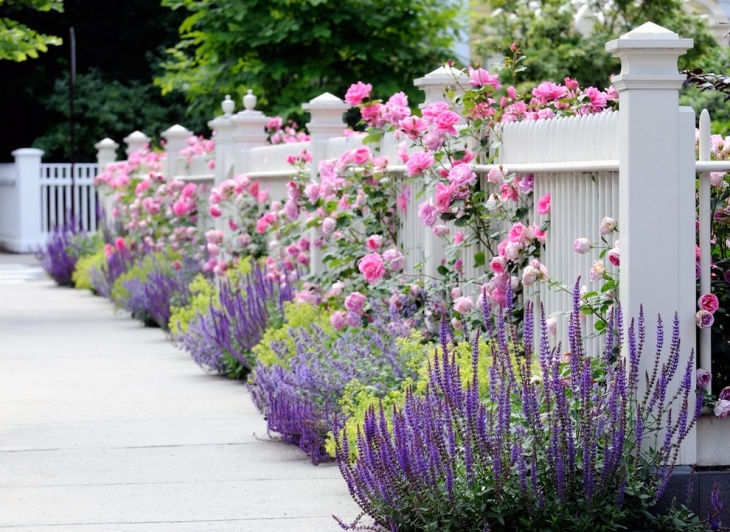 The pink roses climbing the white fence is the best feature of this garden. 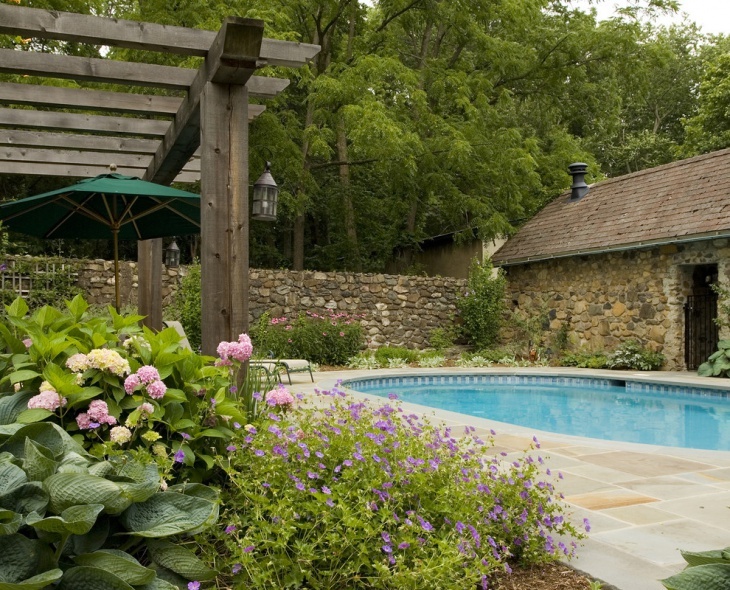 Use of English garden sheds has been a tradition for formal landscaping. But that does not mean that your space should be neatly manicured or huge before you can place a shed in your own garden. 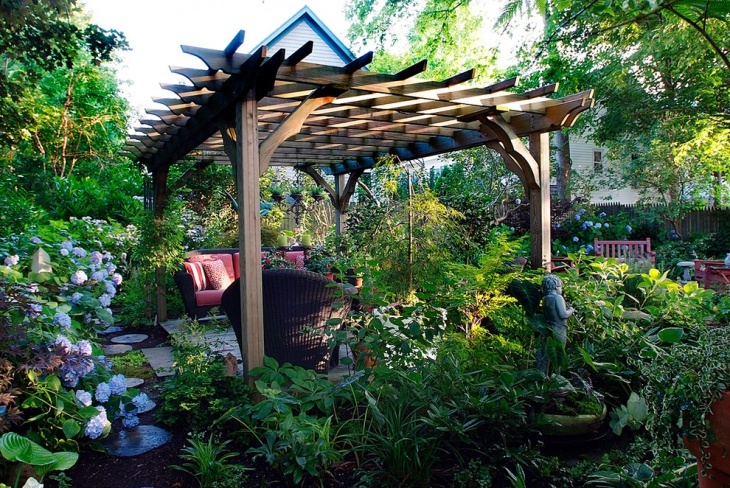 A pergola in the middle of the garden to provide shade for the garden furniture should be a nice choice.